The Mekong region is home to over 326 million people and has maintained GDP growth between 5-12% for the past 20 years. With over 10 years of experience in the region, the manager is positioned to provide unparalleled market access and returns. 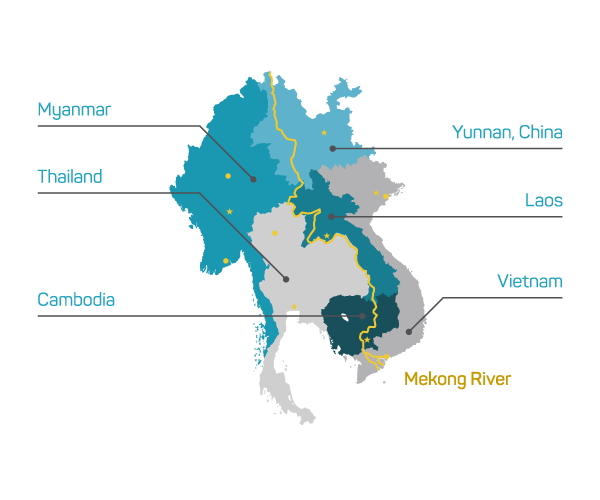 The Mekong Fund invests in companies in Thailand and the countries of the Mekong Region: Cambodia, Laos, Myanmar, Vietnam and Yunnan Province in China. Knight Mekong Fund is a directional long equity fund, aiming to provide investors with medium to long-term capital appreciation from a managed portfolio of mainly quoted securities on stock exchanges in Mekong Region. The Fund emphasizes value investing in Mekong Region markets (Cambodia, Laos, Myanmar, and Vietnam, including Mekong Company listed outside the region such as Hong Kong and Singapore with particular emphasis on industries which have developed successfully in Thailand, and industries/companies benefiting from AEC and Thai/Mekong integration), and South Asia. The Fund strives to achieve reasonably low volatility (given the nature of Asian emerging markets, some volatility is inevitable), and out-performance over both absolute and relative benchmarks (e.g. MSCI Asia Ex Japan Index). Disclaimer: FMG (MALTA) Ltd. (“FMG”) is licensed by the Malta Financial Services Authority (“MFSA”) as a category 2 Investment Services Provider as provided in the Investment Services Act Chapter 370 of the Laws of Malta. FMG is authorized to act as a full scope alternative investment fund manager (“AIFM”) in terms of Directive 2011/61/EU of the European Parliament and of the Council on alternative investment fund managers (“AIFMD”). This summary is for information purposes only and does not constitute an offer to sell or a solicitation to buy. Citizens or residents of the United States and India may not invest in these Funds. All Funds may not be marketed to Swiss citizens or residents except those considered as “regulated qualified investors” by the Swiss Collective Investment Schemes Act and the Swiss Collective Investment Schemes Ordinance. All Funds are not to be marketed to EU or EEA investors. Investors who wish to obtain information on these funds will only be provided any such materials upon receipt of an appropriate reverse solicitation request in accordance with the requirements of the EU AIFM Directive, Swiss Law and/or national law in their home jurisdiction. Opinions and estimates constitute the manager’s judgment and are subject to change without notice. Past performance is not indicative of future results. Investments in Emerging Markets should be considered high risk where a portion or total loss of capital is conceivable. The synthetic risk-indicator illustrated herein comprises 60 months returns calculated in USD and is updated once per annum. No assurance can be given that the investment objective will be achieved or that an investor will receive a return of all or part of his/her initial capital, and investment results can fluctuate substantially over any given time period. Please refer to the relative fund’s prospectus which contains brief descriptions of certain risks associated with investing in the fund. FMG funds or third-party funds marketed by FMG are aimed at experienced investors and you have to ensure you are able to invest in such funds. Questions should be directed to your local representative or financial advisor. This document may not be reproduced, distributed, or published for any purpose without the prior written consent of the manager. All information contained in this communication is as provided by FMG (MALTA) Ltd. Return chart: The Mekong Fund ISIN LU0903793569, MSCI EM Index, MSCI FM Index (USD). Data source: Bloomberg. Exposure chart is updated January 2019. Data source: Siam Knight Fund Management. Copyright 2019 (C) FMG. All rights reserved.